Rebirth is the second book in the Aftertime series by Sophie Littlefield. I love the Aftertime world Sophie Littlefield has created. This is a great "escape" series to get lost in. 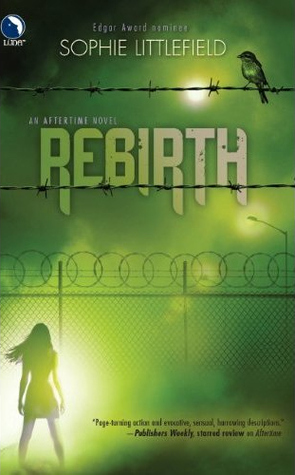 In Rebirth, Cass heads back out into the world of zombies and (even more frightening) humans. Her journey is suspenseful and even chilling at times. The zombie "beaters" play a much larger role in the first book (Aftertime) than they do in Rebirth. Rebirth focuses more on Cass and the dystopian "Rebuilders" of Aftertime. I'm not a huge fan of the characters in Rebirth, but it ends on a great note introducing us to some new characters who have a lot of potential. It has me looking forward to the final book (Horizon) in February 2012. If you are a fan of post-apocalyptic or dystopian books, this is a series you will want to read. I am really really starting to enjoy dystopian books. I have to give this one a try. Thanks for the introduction into this series. Anyway keep up the nice quality writing, it's uncommon to peer a nice blog like this one nowadays..